Now $100 off - hurry, limited time offer! You can give your truck a mean new off road look with a set of Smittybilt M1 fender flares. The rugged riveted style will instantly add style and protection to any truck. 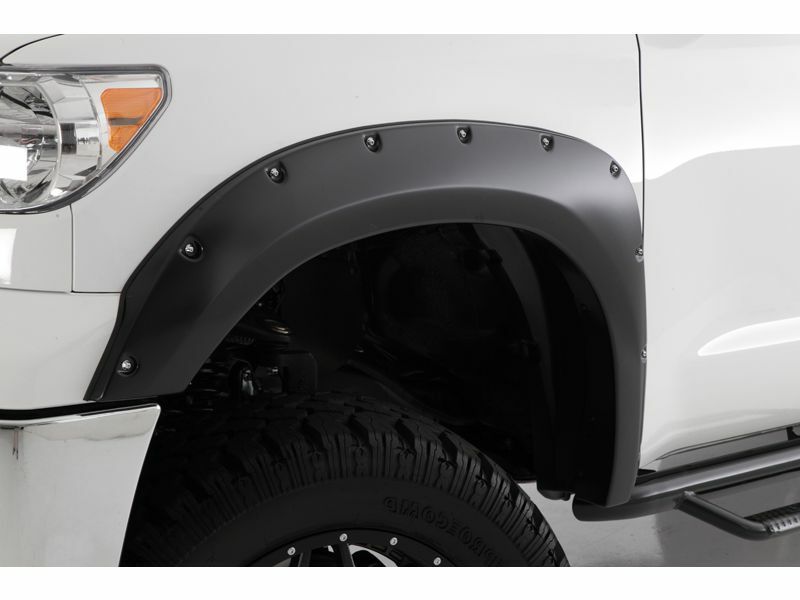 Smittybilt uses an oe quality ABS plastic material in the construction of their M1 fender flares. This material is resistant to heat and UV fading. Protection varies by vehicle but on average, these fender flares add an additional 1.5" of tire coverage to accommodate for larger wheels & tires. The high quality of the material used by Smittybilt even allows you to custom paint your flares if you want to have them match your trucks paint. Mounting these fender flares will be a piece of cake. There is no drilling, cutting, or any other modification need to get a proper fit. A rubber gasket is included for a weather-tight fit along with all the needed hardware to make your life as hassle free as possible. The sooner you order, the sooner you can start to enjoy your truck's new look and the added protection you get with Smittybilt M1 fender flares. Go ahead and get yours now! Smittybilt warrants to the original purchaser of this product that should the product or any part thereof, under normal use and conditions, be proven defective in material or workmanship, such defect(s) will be repaired or replaced (At the Company’s option) without charge for parts or labor. To obtain repair or replacement within the terms of the warranty, the product is to be delivered with proof of warranty coverage ( e.g. dated bill of sale, receipt), specification of defect, freight pre-paid with Returns Good Authorization Number from Smittybilt to place of purchase. Items returned to Smittybilt Automotive without an Returns Authorization Number will be refused and returned to sender at the senders expense. This warranty does not apply to any product or part thereof which, in the opinion of the Company, has suffered or been damaged through altercation, improper installation, mishandling, misuse, neglect accident or acts of nature. THE EXTENT OF THE COMPANY’S LIABILITY UNDER THIS WARRANTY IS LIMITED TO THE REPAIR OR REPLACEMENT PROVIDED ABOVE AND, IN NO EVENT, SHALL THE COMPANY’S LIABILITY EXCEED THE PURCHASE PRICE PAID BY THE PURCHASER FOR THIS PRODUCT. herein in connection with the sale of this product. Some states do not allow limitations on how long an implied warranty lasts or the exclusion or limitation of incidental or consequential damage, therefore above limitations may not apply to you. This warranty gives the purchaser specific legal rights. The purchaser may have additional rights, which vary from state to state. Some states do not allow limitations on how long an implied warranty lasts or the exclusion or limitation of incidental or consequential damage, therefore above limitations may not apply to you. This warranty gives the purchaser specific legal rights. The purchaser may have additional rights, which vary from state to state. M1 fender flares are designed so you can install them yourself right at home if you like, without any drilling or cutting needed. All you will need for proper mounting is a few standard hand tools. If you have any questions or for additional information, please feel free to call us at 1-877-216-5446 or 701-253-5906.